Is your pantry full of hard-to-pronounce ingredients like xanthan gum, agar agar and agave? 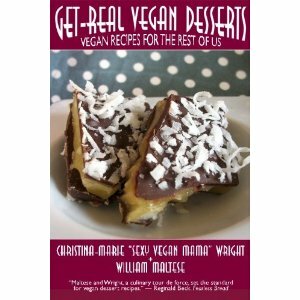 That doesn't stop me from creating delicious vegan desserts with "regular" ingredients which can be found at most major grocery stores, and I've put the recipes together in a sweet vegan cookbook, co-authored with international best-selling author William Maltese. It was just released, and you can find it on Amazon, here. These recipes are perfect for vegans, vegetarians, those watching their cholesterol, and the veg-curious, as they're not complex or intimidating. Infused with humor, Get-Real Vegan Desserts: Vegan Recipes for the Rest of Us is the perfect cookbook for beginners and accomplished chefs alike. I hope you love the recipes as much as I loved creating them!